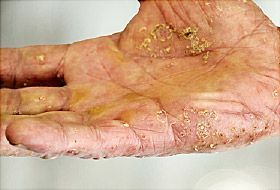 Palmoplantar pustulosis is an autoimmune disorder that causes blister-like sores to show up on the palms of your hands and the soles of your feet. It can also cause cracked skin or reddened, scaly patches. There's no cure for PPP, but it a dermatologist can treat it. Sometimes it comes back. But it could go away and never return. PPP first appears as tiny blisters with yellow pus. Eventually, these turn brown and become scaly. PPP can also cause painful cracks in your skin. The blisters and sores can make it hard for you to walk comfortably or to use your hands without pain. The cause is unclear, but there's a known link between PPP and smoking. Studies show that up to 90% of people with the skin condition smoke or once did. Nicotine in tobacco products can affect your skin cells and cause inflammation in your sweat glands, especially on your hands and feet. If you stop smoking, your symptoms may get better. Any adult can get the condition. But more women have it than men, and it's most often found in people between 40 and 60. As many as 24% of people with PPP also have psoriasis. Psoriasis happens when skin cells build up rapidly with thick, silvery scales and itchy, dry, red patches. To see if you have PPP, your doctor will check your skin. Most often, they'll take a painless scrape or swab of the area. Sometimes, they'll need to remove a small piece of skin to confirm PPP. The area will be numbed, and you may need a few stitches afterward. Your doctor will look at the tissue under a microscope to see if you have PPP. Topical steroids . These creams, used with a sterile bandage or vinyl dressing, are anti-inflammatory treatments. They can help with inflammation, swelling, tenderness, and pain.
. This ointment can help heal blisters and make them less itchy. Coal tar also slows the production of your skin cells and helps shed cells so your skin doesn't become thick. Acitretin tablets. Made from , these can help you manage PPP. But acitretin can have strong side effects, so it's not for everyone. Women who are pregnant or may become pregnant shouldn't use it. Men who want to have children should talk to their doctor before taking it. Photo therapy or PUVA. This treatment uses medication along with ultraviolet light to slow down skin growth and help with symptoms for long periods of time. Don't use bubble bath or shower gel. Do use a soap with moisturizer. Protect your skin. Wear vinyl gloves when you work with water, use household cleaners, or work in your garden. Wear 100% cotton socks, and avoid shoes made from man-made products. Be careful. Any injuries, even minor ones, can be hard on your skin. If you have an injury, use waterproof bandages. Keep the affected areas clean. Rest your hands and feet often. British Association of Dermatologists: "Palmoplantar Pustulosis." Canadian Medical Association: "Palmoplantar pustulosis." Melwani, P. JAMA Dermatology, November 2009. National Center for Biotechnology Information: "Rapid Improvement of Palmoplantar Psoriasis after Cessation of Smoking."